Hi all! I'm not even going to apologize for my lack of posts lately. Let's just say in another 18 days, you'll have lots of posts from me. I've been in a swap making frenzy getting ready for the Stampin' Up! national convention coming up early next month. Because so much of what I've been creating is for organized swaps, I don't feel that I can share them on my blog until the swapping has taken place. So, while I'm gone I'll make sure to post all the cool swaps that I've done over the last month and give you lots of inspiration and ideas! 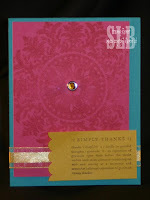 Today I'm posting a card I did for today's Color Challenge over at Stampin' Addicts. It used three of the new In Colors. I've been working with these colors since late April and I have to admit, it's taken some time for me to get use to them. However, today's color challenge is one of my favorite combos. I love how these three colors work together and they make a very nice card. So, here's today's card. All products from Stampin' Up! I hope you'll create something with this fun combo and when you do, upload it over at Stampin' Addicts and join in the fun!! Hi Sharon, Miss ya! Love, love, love this stamp! It's Not the Destination....it's the Journey! !